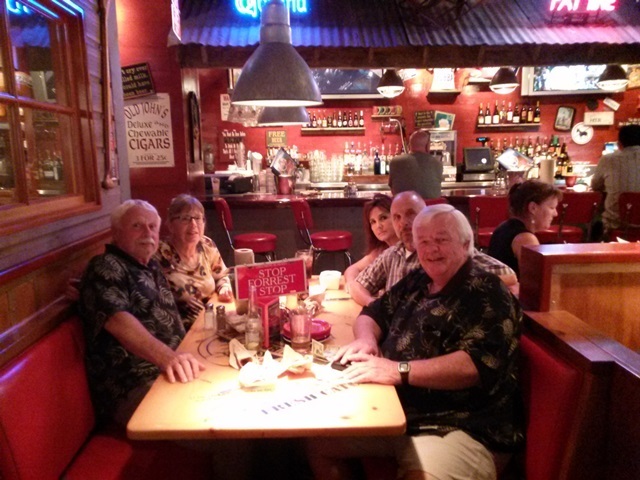 On Wednesday, September 4, 2013, some of the West Coast Charlie Company troops got together for dinner at Bubba Gumps in Anaheim, California. Jack and Kathy on the left were joined by Mike and Jeanne Stokes with Fred Childs. After dinner it was on to Hooters. We don’t have a Bubba Gump up here, but we enjoy one when we go to Oahu, Hawaii. It’s always good to fellowship with Brothers. Hope to see everyone in GA. You guys are great. If anyone remembers my father, Richard (Ric) W. Horch, please reply to edencharity@gmail.com. I am trying to find pictures and stories, if possible. The visit to Hooters was a tribute to Kevin Roach. We raised our glasses in remembrance of a fine young man and a real friend to Company C! We miss you buddy!